Our Little House in the Big Woods: A Favorite Corner. Do you have a favorite spot in your home? I have a number of spots that I love to spend time in. Maybe I'll do a little feature here on the blog about all the corners in our home. Let me know if you'd like that. I'd love to see yours too! 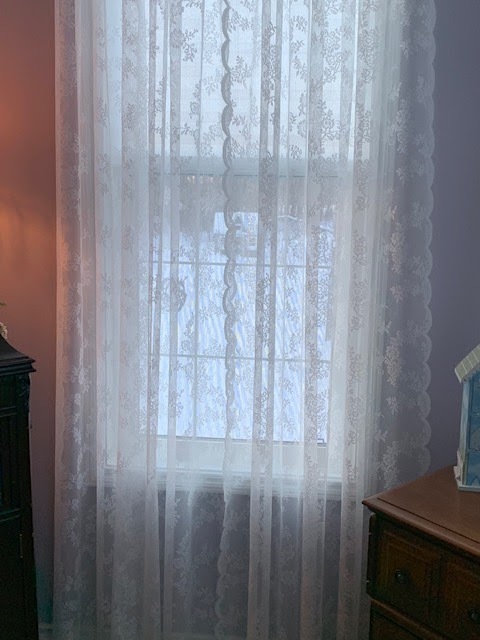 Lace curtains let the sunlight shine through, the small lamp adds more when the days are dark with clouds or in the evening when just a bit of light in this corner is needed. 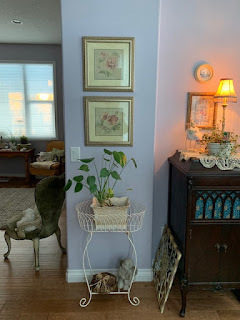 A small round vintage picture from the Antique Mall and a framed floral print underneath, above the china rabbit (she has clothes on!) sitting on a wire chair and a potted plant. The corner I've chosen today is in our main floor turret ~ it's 3 stories high, with the lower level housing our daughter's kitchen nook and the upper level is our master bedroom sitting area, complete with a window seat under all the windows. On the main floor, we use this corner in a variety of ways though the year. 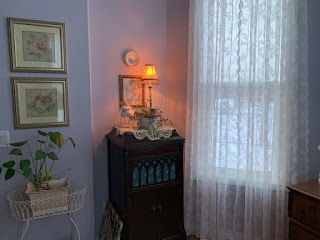 It houses our old Victrola, currently a writing desk and our tea cart (not pictured). Oh, and my gramma's hope chest (also not pictured) sits along the end of the staircase. It holds our Christmas tree decorations through the years. In the Winter, this space is where we set up our Christmas Tree. And other times, we move the desk out and the piano in and it becomes the music room. Very versatile and always fun to change around. I love the 2 floral prints we picked up at the charity shop for $4 for both. But then it was a 50% off day, so we actually got both for $2. We bought them to put in to our Antique Mall booth. However, after a few weeks of sitting on the desk, I picked one up and held it up in this spot and suddenly they had a new home! Love them and I do promise to take a closer shot so you can see the lovely flowers and the border and the pretty gold frames. The plant in the stand has tripled in size since we moved it there a few months ago. The light is just perfect but it's grown so quickly, I'm going to have to repot it soon. The wrought iron unit it is sitting in was a boot sale find ~ I recall paying about $6 for it. At the end of the day. No one else had bought it, so the vendor reduced it down to $6 just as I walked over to her. Perfect timing! Underneath is a folk art basket and a stone angel that I should probably put in the garden in the Spring but for now, it sits cozy and content on the bottom shelf. Resting next to is is another wrought iron piece that we're trying to decide where it should go. It was at the charity shop, sitting behind some pots and other outdoor items, almost buried. Paid $4 for it, again on a 50% off day. It was in my cart and every few minutes someone was stopping me in the shop to ask where I had found it! According to the staff, it had sat in that very spot for over 2 weeks. And suddenly everyone wanted it. I love treasure hunting there because you really have to be willing to push other items aside to see what's hidden behind. So much fun! One of the many writing desks in our home. 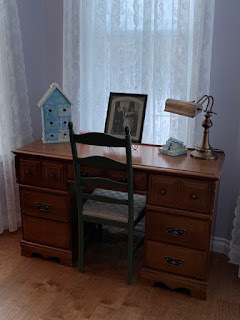 We have a desk under the stairs in the great room, this one in the turret, the secretary desk in the living room, a desk in our guest bedroom, one in our master (in the turret that is set up like a mini office) and my husband's editing desk in the art studio. Grandson has a desk in his bedroom in the apartment and youngest dd has one in her bedroom as well. If I've counted right, that is a total of 8 desks in one house. On this desk is a sweet birdhouse unit. Each of those round holes is actually a drawer. 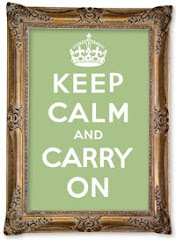 I don't have anything inside at the moment but in time, this might end up in the art studio to hold small art items. Or in the laundry room where I have collected framed prints of birdhouses. Next to it is a small pink candle holder, then a framed picture of dh's grandparents. On the back, it says "Wedding 1927" and we're trying to determine what their wedding date was. Next is a pile of notepads, typed up with a pretty blue ribbon and a vintage banker's lamp that belonged to dh's parents. I love the green ladder back chair. The other one sits at our desk in our master bedroom. This is a lovely spot to sit and write, while gazing out at the little forest to the south of our house. A calming and inspiring spot in so many ways. 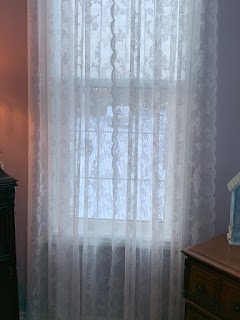 The lace curtains let in just the right amount of light and filter the strong sun on the days it's very bright outside. I love that we can see our little potting shed through the lace. We truly don't need curtains out here but I don't like the look of completely naked windows ~ to me, they always look like the room is unfinished. Working on the second layer of curtains to go on here. I have the living room and dining room figured out, along with the kitchen nook, the laundry room, the french deck door and the huge window in the great room ~ that's a whole other post. But the turret still needs some thought. I'm in no rush. I know just the right look will come to mind one day. There are 4 windows in the turret and they are very tall ~ 6 feet in total height. So planning here for window coverings will take some time and a lot of input from family. We'll get it right, in time! That's the tour of my current favorite corner. I'll take shots of the hope chest and the tea cart later. I'm off to spend some time with my family on this special "Family Day Holiday" in Canada. I don't think we need a day off to spend with family as we're together all the time but appreciate our leaders believed in a day to reconnect and do something fun with family and friends. Hope you'll join in and share some of the favorite corners in your home that we'd love to know more about. Post in the comments or your blog. Can't wait. I love the corners you've shared! I would love to see more so I can get inspired to make my own favorite corners. ( where the major leaks are).